Tis the season to be luminously spankylighty all over the world. Xmas lights are my favorite thing about the holidays. Heck, last year I even bought —and reviewed—a Philips Livingcolors Lamp to illuminate our tree with multicolor goodness, much to Addy's glowing desperation. But hey, I can't help but to get all teary with all this heartwarming twinkling stars. 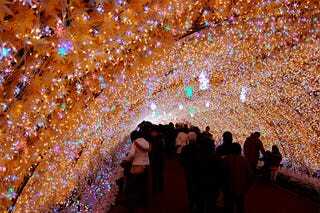 In Tokyo, however, they go from sparkling lights to sensory overloading LED mayhem, like these photos show.